Aisling is going to collectively get fat at this rate. 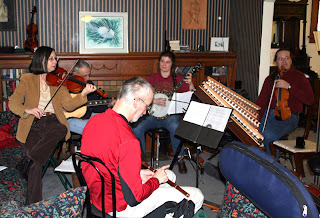 We had another productive rehearsal on March 4th - this time at Stuart's house. 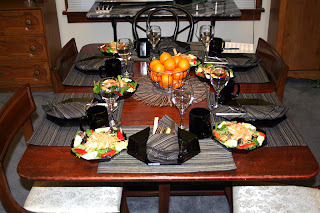 Stuart did Asian cuisine for us. Not too shabby for a bachelor, eh? Take note, Ladies - this guy can cook! Stuart is now having a good time in China - just as we gear up for the St. Patrick's Day celebrations. The upside to this trip, besides Stuart having a good time, is he can learn some more recipes and we can have another yummy, I mean, productive, rehearsal at his house. We played a concert last week at the Gerlach center - that was with half (or nearly half-Aisling). This was a noontime concert for a nice group of senior citizens. Whilst we were playing, the fire alarm kept sounding off. I'll interpret that to mean that we were really hot and not that someone was desperate to escape the premises while we were playing. Last night we played at the Wesley Glen center - another venue for some nice seniors. This was a lot of fun for us because John Sherman joined us as a sub for Craig, who pulled a 24 hour shift at the hospital and couldn't be with us. The other fun aspect of last night's concert was the interaction we had with the audience. They were very curious about the music and our instruments and asked a lot of questions. We all had a good time together. Our big day is St. Pat's, though, and we'll be playing three concerts in three different cities. We start out in the morning in Dayton at the Dublin Pub, where we'll play from 9:30 to 11:30. Then we have to rush back home to grab our sound system and head to Westerville to play a two hour set (2 - 4 pm) at the Old Bag of Nails pub. Our day ends at Groveport with a concert at their wonderful town hall on main street where we play from 8 to 9:30 pm. I love the acoustics of the Groveport Town Hall. Join us if you can and say hello to the band!